Today I'm sharing my last two projects from October's Create magazine. I'm doubling up because they were both made with the same supplies. There was no requirement to use a sketch for the Halloween Gallery, but of course I did anyway! 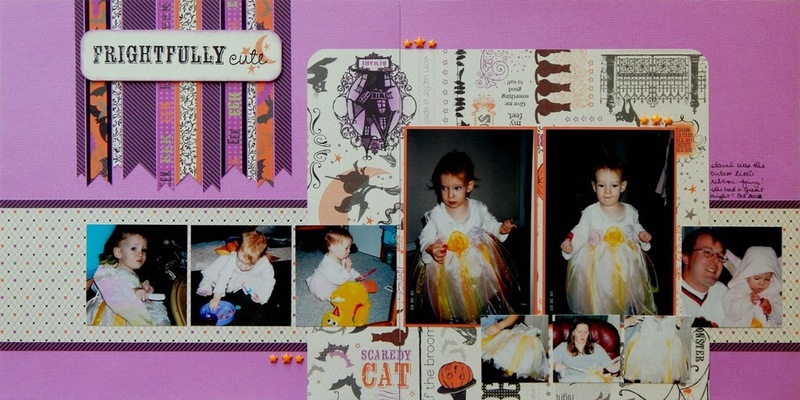 This was made with the Scaredy Cat Paper pack from Close To My Heart, Bazill cardstock (because I did not have 2 sheets of the matching Thistle CS from CTMH yet), and the Halloween Greetings stamp set with Black and Sunset ink. I also used some White Enamel Stars that I colored with an orange Copic marker. Don't be scared by how complicated this looks! While I used the sketch exactly as drawn, there are several other examples in Create where they used a looser interpretation. And this really isn't as hard as it looks either. It just took a little thinking, and I temporarily adhered a triangle (from the art department) to my paper trimmer so everything was cut at the same angle. Again, I used the Scaredy Cat paper pack. I switched to stars from the Scaredy Cat Assortment because all three colors were already there for me - no coloring! I again pulled out the Halloween Greetings stamp set for my broom and sentiment, using black ink and White Daisy pigment ink for stamping. Thanks for checking out all of my Create projects this month! Be sure to go check it out for yourself, and maybe even submit something for the January issue based on one of their free sketches. Speaking of which, the sketches are available for free download in the Scrapbook Generation online store. Past month's sketches are all there as well. Great scrap page!!! I love that paper!! Cute pix! !